Have you ever found something you love? Love so much you want to learn everything about it? That’s how I felt about a year after I started shooting. I never picked up a gun with the intention of falling in love. At the age of 39 the only thing I ever knew about guns were they were loud and scary. In fact, my first husband wanted a handgun and I told him “Not in my house!” My mom told me at a young age not to touch one if I ever see one, and that’s kind of where I was on the whole idea of guns. Until the day came that I was working alone and was uncomfortable with a client I had. I went home and thought...it was evening, dark outside. My building had no camera and I was the only business open at that time of night. Just to be clear, it was not late; 7 pm, but still dark enough for someone passing by to not see any possible trouble. In that moment, I knew I needed to find a way to protect myself: to not be a victim. 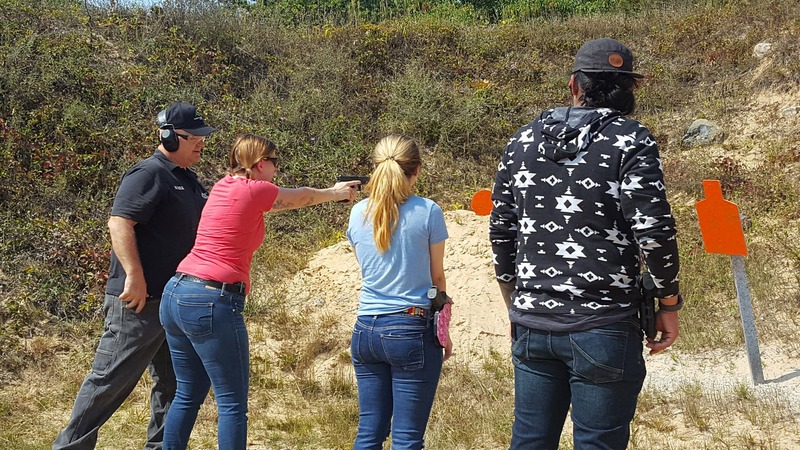 I heard about this class being offered for people wanting to learn how to shoot a gun. I signed my husband and myself up. He had never had any interaction with a gun either so I thought if I was going on this journey maybe he should too. The class consisted of the safety of shooting, how to properly shoot, and shooting a rented .22 handgun for 10 rounds. I learned a lot. Or so I thought. I learned so much I started on my journey of buying my very first handgun. After all, I took a two-hour class. I was an expert! I went to a few gun stores. Talked to the staff. Held a few different guns. This went on for a few months. I was searching the answer of which gun was right for me, but not really knowing what questions to ask. Then one day, as I looked at guns for sale, the staff told me I should rent the gun, try it out. Good idea, right? Kinda. Now, I’m holding a gun I do not know anything about. By myself. In a stall. With other shooters standing in the other stalls firing their guns. And its loud! Great, this will be fine, I tell myself. I rented a 9 mm because every man will tell you this is a must carry for personal protection. Ten rounds 10 bucks. Here we go. I load the gun. Rack the slide back, aim and fire! I felt that recoil travel right through my arms and set the gun down. I decided right there after shooting a random gun one time that 9 mm was too much gun for me! Fast-forward a few weeks. Still gun shopping. Still unsure of what I’m doing. I knew this: I shot a .22 and a 9 mm. I was told the .22 was for hunting small prey, not a personal protection gun, so how about I buy a 380 because the recoil would be more manageable. I told myself I needed a 380 and any gun I was going to buy (brand still unknown), must have a safety. My mind was made up. The thing about gun shopping is getting random men’s opinions on what the best gun is and, trust me, everyone has a favorite and everyone is right. Never once did I have a woman sales person and I began to feel like just a girl lost in a man’s world. Not really finding facts, which would help me, just every man’s opinion. Right down to them laughing at me (or were they joking), at my choice of caliber. That’s not intimidating at all. I cannot tell you how many times I was told a 380 would not stop someone trying to harm you. Until one day this salesman tells me, “I have the perfect gun for you.” In fact, he just got it for his wife to carry and I was super excited to see this gun that fit my requirements that another women enjoyed as well. Here it was: a black, new shiny Bersa Thunder 380. It even had a safety. Boy oh boy! I whipped my debit card out right then and there. I was so proud! After months of searching and hearing so many gun terms I did not begin to understand, I bought my first gun! It even came with a free range pass. But here was the problem. I knew absolutely nothing about guns. And so, the long, strange journey began or did it? After a few weeks I decide to go to the range. I have a free pass after all. So it's time to buy ammo. But what kind?! That’s a great question! There are so many to choose from. I find myself lost again. What is a grit? Do I want the box with an eagle? Oh look, pink tipped. Full metal jacket, isn’t that the name of a movie? Snub nose? Hollow point? I finally decide to, once again, go ask for help. Once I’m told which box of ammo is for me, I’m ready to shoot! But wait? It's kind of hard to load the bullets. I need to buy something that will help me load my magazine. Do they have a pink one? Nope, just black. Fine I tell myself, black will have to work. I had read recently that according to Pew Research, 1 in 5 women own a gun. Why do I continue to feel like this is a man's world? Oh well, NOW, I’m ready! My gun came with two magazines so I load them up and I’m ready to shoot. What I was doing was dragging my feet. I was scared to death of this gun and the class taught me enough to know I have no idea what I’m doing! So I go to the range. Five rounds in, the gun jams? IT JAMS!?! What am I going to do? This is scary! I was taught about jams in class but was in no mindset to handle one. So, I give the gun to my husband and somehow he clears it. Now I’m scared but determined. I fire off a few more rounds and I had a squib load. WHAT? I didn’t know what is what at the time. So, my training kicks in and I stand there. Gun pointed down range and count to 30. At this point, my nerves are done. I’m done. My husband finishes off the magazine and we go home. I put my gun away and don’t touch it for a month. Trying to decide what to do I call the place where I bought the gun. They offer personal training for an hour. Great! That’s what I need! Some one-on-one training and I will be fine. Wrong! It was not at all what I thought it was going to be. He just stood behind me for an hour, while he had me slowly pull the trigger, so I could feel the way the gun worked. Standing there with my arms held straight out, tense for an hour did not really help my mindset on this whole scary gun thing. I think every time I pulled the trigger I jumped! I was then informed I did great and just need to go to the range and practice. OK?! If he is telling me this then I must be ready to shoot on my own. There’s a small, local outdoor range by my house. I signed my husband and myself up. Thought maybe we could shoot together. We went once. I paid in advance for a year. Gun jammed, I know, big surprise. We went and got the guy running the booth because we were not able to unjam the double feed that was going on. The attendant was really nice and showed me how to clear the jam with a knife. Ok, I tell myself. I just need a knife. So, that’s the next thing I bought for my kit, but really I was losing faith in myself to keep pushing myself to learn how to defend myself with each failure. When it came down to it I just became more scared each time it jammed. I wanted to give up. I called a different indoor gun range and explained my problem. I was told I just need to shoot and training there would consist of the same I have had elsewhere. I thought to myself this is becoming more then I expected. I once again put my gun away and did not touch it for three months. I tried to learn info from Google. With so much information out there and my very, very limited knowledge it became a little overwhelming and confusing. One day, I woke up and decided there has to be help somewhere. I wanted to not be afraid. I wanted to learn. There has to be a better trainer out there? So I, once again, turned to Google and what happened next was my best gun experience so far. I called Today's Weapons. I tried to explain to this person I never met in my journey so far, which probably made me sound like a hot mess. He talked to me for a long time, poor guy lol. He explained his training and prices. I signed up for a two-hour class that was about to change my life. I just didn’t know it. I knew going into this I was in good hands because of our phone conversation. I would come to find out this was the best choice I had made so far. But I was beyond nervous. Once we met I showed Mark my gun. We got right down to business. 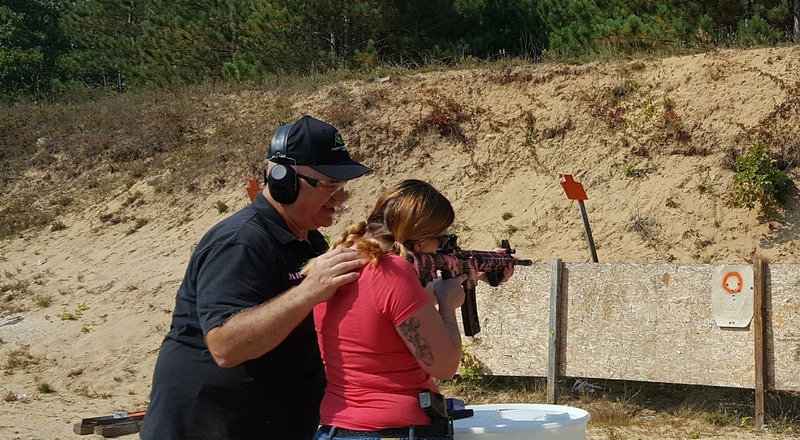 He explained my gun to me, and why it's not the gun for me. Then he showed me a couple of his recommendations. He also showed me how to operate each gun. Great, I thought, I’ve already learned more in 20 minutes than I did in a year. Next up it was time to show him how I held my gun, wrong! I had been trained wrong. He showed me how to properly hold the gun, but never making me feel stupid. Before I knew it we were on the range. Mark had the two different guns set on a barrel. He handled all of the loading and unloading. We went through the safety commands and he handed me a gun. I didn’t want to pull the trigger. I was shaking so bad he had me pull my arms back in and take a deep breath. Once I released the breath he had me push the gun out and fire. Guess what happened? It fired! I pulled the trigger and felt the weight of the world roll off me. After a few rounds we moved to the gun that turned me into a believer. The Glock 19! She is a 9 mm. Me: liking a 9 mm? Remember when I said they were not for me? Well, I believe they were not for old me; me before Mark. Then I learned how to hold a gun. How to stand correctly. And the sun shined! After I left the range I could not believe I had just shot not one but two different 9 mm, with not one jam. Mark did ask me if I wanted to shoot my gun, but I said no. Just the thought of that thing jamming was not for me. So, I guess that should be the end of my story, right? I learned, I trained and most normal people would go to the range now and practice by themselves. But it was so much more than that. When training with Mark I felt safe. What I knew I could not handle, he could. He has police and military back ground, I could only imagine how many guns he has trained with. 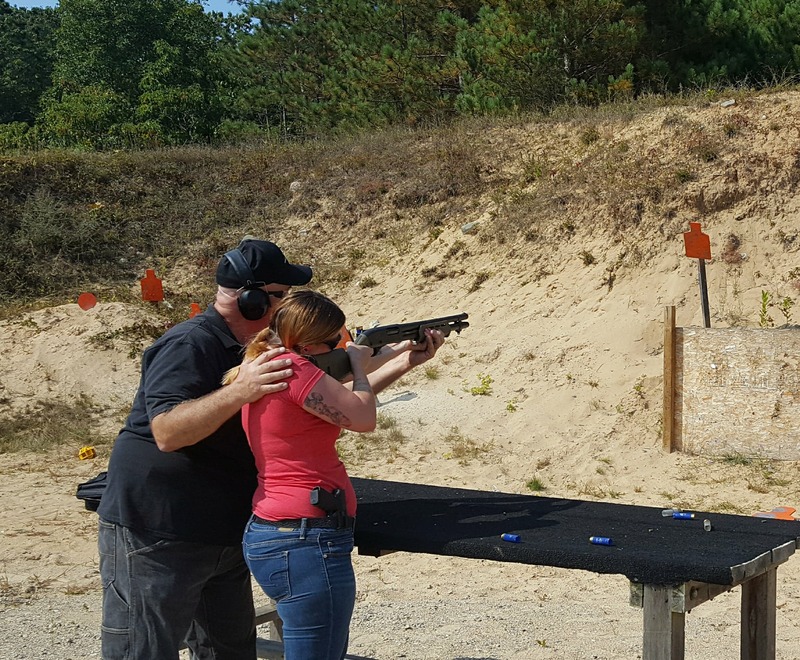 That first training day I learned I love, love, love the empowering feeling of shooting a gun and could not wait until I had enough money saved up to train again. I trained with Mark a few more times in the course of a year. Each time, feeling more and more secure in my ability to fire the gun properly. We even started firing from a concealed carry position. I loved the way the bullets sounded hitting the metal targets and when I would leave the range I would get this amazing sense of calm. I still can’t fully describe it. I decided I was ready for the concealed carry class. Why did it take me so long you may ask? I don’t know. My guess is gun safety is very important to me so I wanted to make sure I knew what I was doing before standing before strangers and firing multiple rounds, required by law to pass the test. The class was informative and I learned a lot. Range time comes and for some God-awful reason I decided I was mentally strong enough to fire my own gun at the test instead of renting the gun I had been training with. After all, I had made the decision to buy it, it was time I use it. Mark gives the command and everyone starts firing. My gun fires twice and jams! And guess what I did? I cried! I CRIED! Me, the person who never cries, cried. Was I scared? No. Was I upset?! BEYOND and that was it! I rented a gun and finished the day. I passed the class, feeling like a complete failure! I knew I was done with that gun. I sold it and what a relief it was to see it go, but now I have no gun? 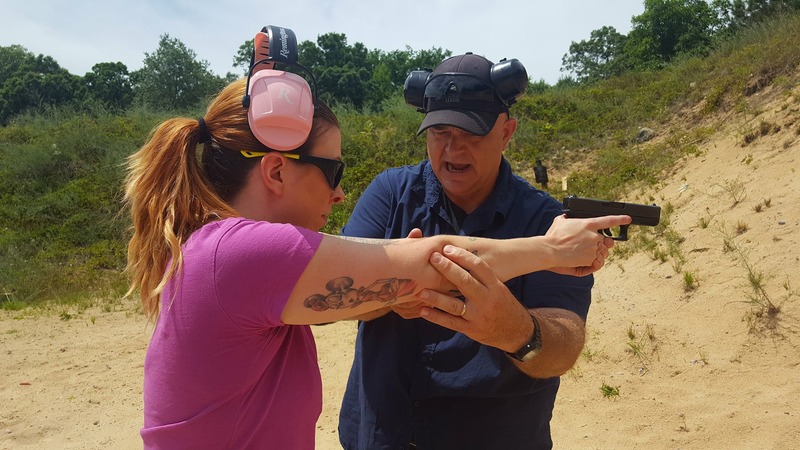 I continued to train with Mark, eventually buying the Glock 19 from him. But my gun jamming issues were not behind me. Not from any fault of the gun. But Mark is not your average trainer and he knew I would most likely have a set back if it did ever happen. So, unbeknownst to me, Mark loaded ammo that jams in my gun and when it jammed he did not let me pass the gun to him to fix it. He talked me through it. I totally did not want to clear this jam. I wanted Mark to save me, but he did save me, by making me do it by myself. And we did this over and over again for a few training sessions till I was clearing my gun like a pro! Mark has helped me with so many aspects of shooting. I no longer shake when I hold my gun. I train and go through 200 rounds like a breeze. I can clear my own gun without missing a beat and fire the next round out. 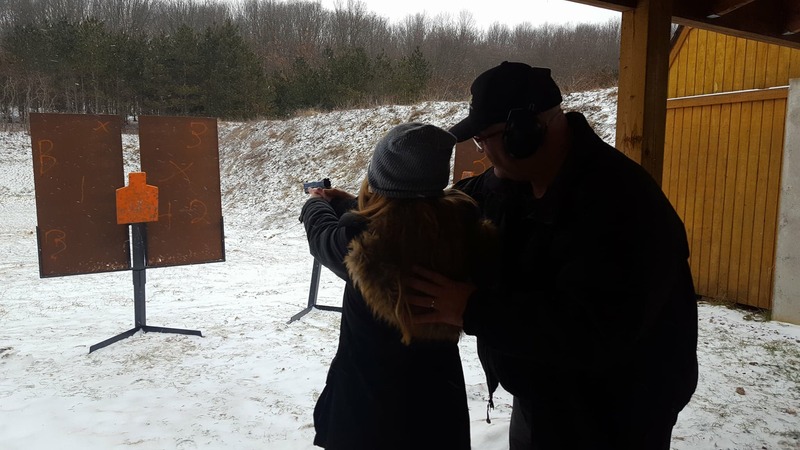 I love shooting left handed, empting my magazine at lightening speed, and as Mark has trained me you never know when your dominant hand might be injured and you have to use your non dominant hand to protect yourself. Talk about feeling in control. I call that my power stance! I can load and unload my gun without looking, once again because firing your gun and needing to reload might not take place in the daylight; yet another thing Mark has taught me. He trains with a timer so I continue to increase my speed and I can’t seem to get enough. It never gets old. He’s always finding new ways to train me. To say I’m addicted is an understatement. My daughter saw how much I was learning and wanted to join, she had taken a beginner class shortly after I did. It was in January. It was 19 degrees outside. Once we got going we never noticed the cold. We had heat lamps and guns to keep us warm. I had bought some pre-loaded ammo, not realizing I did. So, my daughter learned how to clear a jammed gun that day too. She handled it like a pro though. Something that set me back for months seemed like nothing to her. We all learn at our own pace and I could not be prouder of her for not being afraid like I was. We had a great mother-daughter day and she was hooked too - having learned of the magic that is Mark’s training. 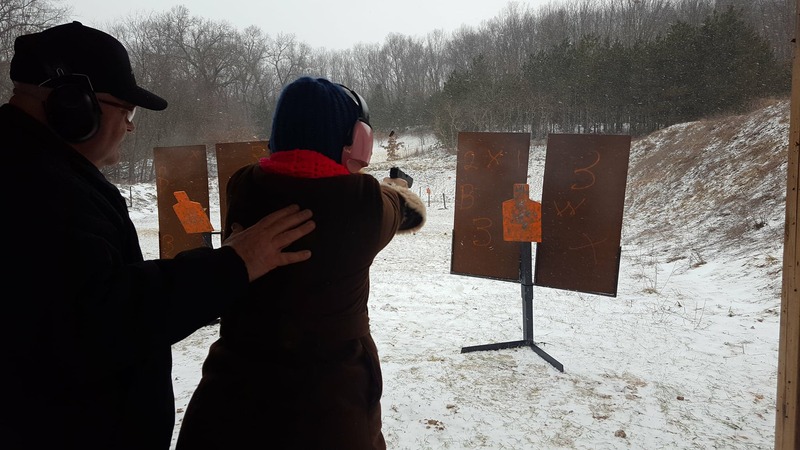 It was not until the summer we got back to the range. At this point, I had only fired handguns. So my daughter, her fiancé and I signed up for a 3-gun shoot out. I didn’t really know what I would be firing but I wanted to expand my abilities. This was probably the class that cemented my love of guns. I knew I loved guns but I never realized how much. We had a blast! 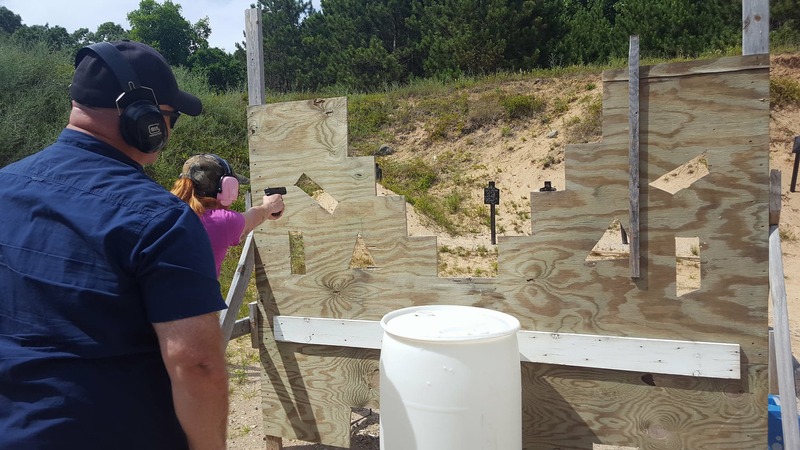 We got to shoot our handguns, a 12-gauge shotgun and the M&P 22. I was so afraid of firing the shotgun, seeing all the funny videos on FB where people fall down from recoil, hit themselves in the face and so on - all of this ran through my head and I did not want to pull the trigger. As I stood there holding the gun I believe I told Mark 5 times I didn’t want to. LOL. After he reassured me I would be fine again and again I finally pulled the trigger. We fired the shotgun 5 times (I think) and moved on to the AR. Now I have heard all the hype of these guns. How could one not living in the USA and having the media attack these guns not hear? Strangely, I was not afraid of this gun. I picked it up and fired 15 (I think) rounds and fell in love with yet another gun. I went home that night pondering the day, but it was not the AR I could not stop thinking about. Surprisingly enough, it was the shotgun. The way it sounded when racking the shell into the chamber...I decided the next day this gun is a must have as well. So, I now have a list of guns I need to buy, like any other gun-loving American, I suppose. Months have went by again with no training. The only problem I see with guns is cash flow. It's a pretty expensive habit. I wonder if people ever pan handle for ammo money? So as the days ticked by I made a choice. A very big choice in my world. I went to the gun range by myself, because my need to shoot finally surpassed my fear of Mark not being there to save the day. Although, he never has to save it anymore, he has taught me how to save it myself, but still that little voice of doubt was there. My soon to be son-in-law and I went to the range. I brought 50 rounds of ammo with me thinking I would probably go through maybe 20 rounds. Boy, was I wrong! I should say I bought the ammo myself before hand, finally, as I now understand the ammo aisle. But, let’s be honest… pink ammo still appeals to me, except now I think more about the firing aspect of the ammo than what it looks like and what’s on the box. I load up and fire. WOW WEE, that’s a rush! So I breeze through 50 rounds and actually go and buy another 50 from the range. I did it! I can’t believe it! It felt great! I even got some cute paper range targets for Christmas, so I definitely see myself going back. My soon to be son-in-law and I want to travel to a bunch of different ranges and test them out. My daughter’s work schedule does not line up with ours, so she will still come along when she can. So, where does that leave me with Mark? He has trained me and sent me out in this world of wonder. Wondering everyday: “when will I get to shoot again?” that is! I’m nowhere near done training with Today's Weapons! It's always good to practice the basics again and again. My speed needs improvement. I’m nowhere near as accurate as I would like. I truthfully don’t see my training ever ending. I can’t wait to see Mark again. He is always teaching me new things every time. My understanding of guns is just a drop in the bucket compared to his vast knowledge of guns. The thought of learning more is so exciting to me! What’s next, you may ask? I would love another handgun; something smaller for carry. Maybe a Glock, maybe not. Don’t get me wrong, my Glock 19 is my girl and she will be with me for life. Maybe one day she will be a pink gun! Yea, I’m that girl!! Have you seen all of the carry options out there? I wouldn’t mind learning how to do competitive shooting? I still need to buy my shotgun and AR. This is going to be exciting and confusing, but with a good trainer by my side I know I'll figure it out.